Ages 5 through 9. Children need to learn to listen for a variety of purposes if they are to experience success in the academic curriculum. Here is a collection of delightful stories, listening games, and high-interest language activities that you can use to promote the development of listening skills that are critical for academic success. The activities help children focus their attention so that they can follow directions, answer questions, and talk about what they hear. Attention, memory, and comprehension are emphasized. The listening experiences can also be used to strengthen important language and thinking skills as children retell stories, compare and contrast, make inferences, predict outcomes, and evaluate information. Listening Skill Builders. This section includes reproducible activities that can be used to develop attention, memory, and comprehension skills. The activities also strengthen thinking skills as children make comparisons, predict story endings, and use language for various other purposes. Adventures in Listening Land. In this section, short stories and poems about various animal characters are presented orally and students are asked to respond to questions. Also included are sequencing activities in which students retell short stories after hearing them read by the teacher. The activities can be used to strengthen memory, comprehension, sequencing, and verbal reasoning skills. 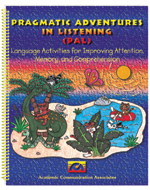 The activities in this book are especially valuable in helping students with communication disorders and/or language-based learning problems.